The heavenly panoramic sea views encompassing the wonder of St Michael's Mount and the whole of Mounts Bay are truly captivating as you arrive at this designer residence located in a peaceful coastal position close to the south Cornwall village of Perranuthnoe. For lovers of the Cornish coast, days spent on sandy beaches, sunsets and barbecues, An Skyber is an obvious choice. A ten minute wander along the coastal footpath will lead you down to the nearby sandy beach or enjoy coastal walks around the mesmerisingly beautiful Prussia Cove, rich in smuggling history. There are some excellent eateries close by including The Victoria Inn just a 10 minute stroll from the property as well as the Falmouth Packet at Rosudgeon which is just a mile away, both have very good reputations. The ancient town of Marazion is close by, with its long stretch of beach popular for sailing and windsurfing, and its fine selection of pubs and gift shops and galleries. The jewel in the crown must be St Michael's Mount standing dramatically against the backdrop of sea and sky this surreal part-time island can be reached by a short amble across the cobbled causeway at low tide or by ferry at high water. Once there, discover the tiny harbour, cluster of cottages and restaurant and cafes for refreshment. Beautifully transformed from a farm building into a stylish and contemporary farmhouse An Skyber offers blissfully light and airy modern living. A chic coastal pad is the epitome of simple uncluttered sophistication. Unrivalled views of sunshine and sunsets make this a truly special place for a coastal holiday. Featuring reversed style accommodation, large timber trusses span the lofty ceiling of a well appointed living room that incorporates a comfortable lounge area warmed by a wood burner and opens into a simply furnished dining area and an ultra glossy kitchen. A central staircase leads down to two comfortable en-suite bedrooms elegantly furnished. Adding versatility for guests, a small detached barn in the private courtyard garden provides a twin bedded suite. With its own water supply (regularly tested), natural resources give environmentally friendly geothermal central heating to the property. Outside is a patio area surrounded by coastal shrubs and pretty flower beds as well as an area for children to play. 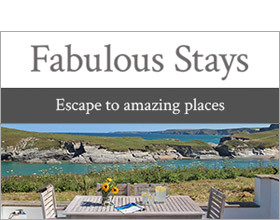 Guests can enjoy the uninterrupted views and sunsets of this magical Cornish location. Reverse level accommodation - three bedrooms: Ground floor 1 x King size bed with dressing room and en-suite bathroom, bath with shower over, basin and WC. 1 x twin with en-suite shower room with shower, basin and WC. 1 x twin with shower room, shower, basin and WC in small barn separate to main house. First floor: Open plan living room with vaulted ceiling through, kitchen, dining area and sitting area including a wood burner and Juliet balcony. Penzance 6 miles; Lizard Point 20 miles. Perranuthnoe is a small pretty village on the south Coast of Cornwall, a mile to the east of popular Marazion resort. There is sloping access to a safe sandy beach with fine views of Cornwall's jewel, St Michael's Mount. At low tide Perranuthnoe is a sandy beach with some shingle and at high tide the beach is mostly claimed by the sea, popular with surfers and swimmers. Enjoy refreshment at the beachside Cabin Cafe or the Victoria Inn is a superb multi award winning pub for good food too! Praa Sands beach and buzzing Penzance are within a short drive.